I could just let the pictures do the talking but I’m not sure they do the landscape justice. 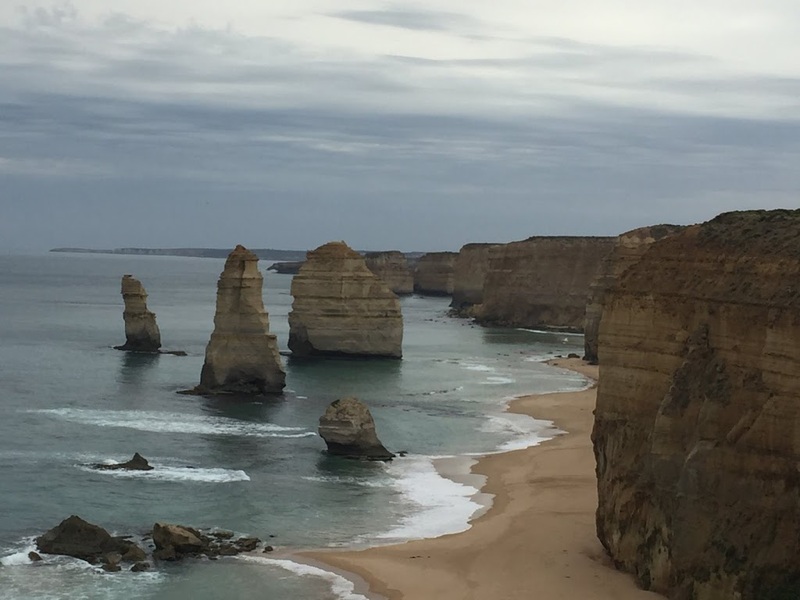 So far our road trip through the wide sweeping beaches of NSW and along the Great Ocean Road in Victoria and over the sea in Tasmania has lived up to all our expectations. And talking of taking pictures, there are a great many viewpoints on the GOR and a great many views. I can hop out of the car, admire the view and take a few snaps to bore the folks back home. I don’t understand why anyone needs sixty selfies standing in front of said view, but apparently they do. I don’t get it – at the Twelve Apostles, probably the highlight of the GOR and viewing platforms organised on a Stonehenge-like scale, it really was elbows at the ready to see the Apostles (sea stacks – yet more O level Geography coming back to haunt me), let alone capture a photo of them without the added extra of a happy-smiley Chinese tourist. 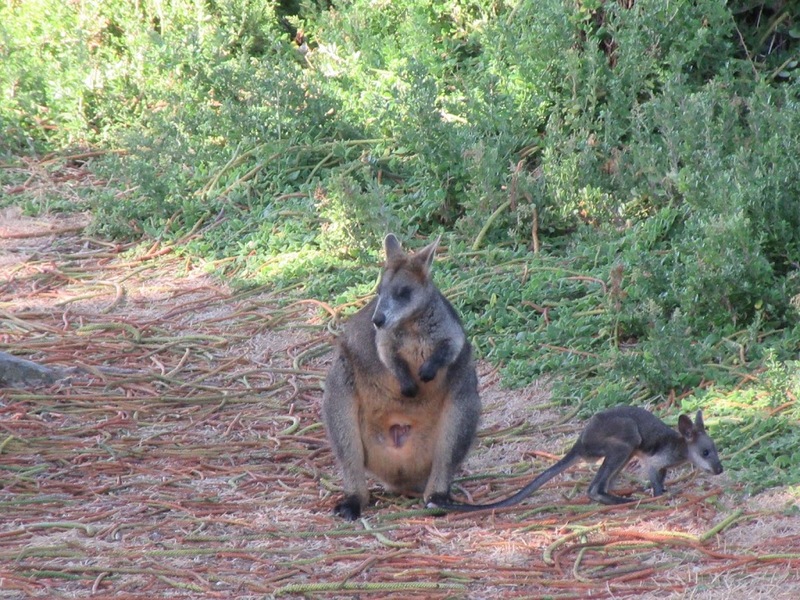 But it’s not all about the scenery, its also about the wildlife. 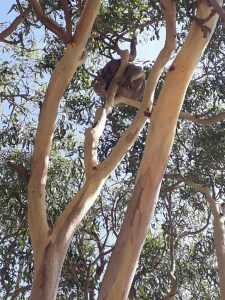 I now know that kangeroos are pretty common place, and I have actually stopped taking photos of them, but I did get very excited spotting that first one, and my first Joey. Add to the list those sleepy koalas, friendly seals, a stingray at least a metre across, a whole menagerie of exotic birds, and now, in Tasmania, the local devils, wombats and fairy penguins, and our trip is in danger of turning into antipodean Springwatch – although its actually autumn here. That’s something we hadn’t thought too much about – I just assumed Australia is hot therefore the holiday season lasts all year round. No it doesn’t. We have stayed in some places that are pretty deserted, cafes have closed up and business is over for the year. Australia is a big country and out of the main cities it seems pretty empty. We’ve driven (or rather Mr T has driven) many miles from Sydney to the picturesque town of Port Fairy before looping back to Melbourne for our flight to Tazzie. We plotted our route at relative random but booked our accommodation before leaving the UK. We’ve been pretty lucky so far, staying in an eclectic mix of accommodation (including a quirky attic room in a pub with hens in the garden and knitted tea cosies on the breakfast table – not quite sure Mr T used to the luxury of corporate travel has forgiven me for that one!). Embracing small town Australia has been a bit of culture shock – as in New Zealand we quickly learned that what passes for a town here, is very much on the scale of what we’d refer to in the UK as a village. I am impressed by the ready availability of public toilets (these things are important at our age), picnic areas, playgrounds and bbq facilities, in even the smllest of communities. Mr T and I hsve become adept speed tourists. With such vast amounts of ground to cover, we’ve had to cherry-pick but boxes are being ticked off. If I am honest the novelty of living out of a suitcase is starting to wear off, and yes I could have got away with bringing less! What’s that you say said, Skippy? Oh go on then, just one more photograph! I’ve already decided my next book is going to be entitled Back on the Bus – an entertaining tale of one bus; fourteen days and forty people. Add in some stunning locations (I might have to work on my adjectives – how many times can I use stunning in one sentence? ), a perfectly matched tour-guide-driver comedy duo, et voila, the next best-seller. 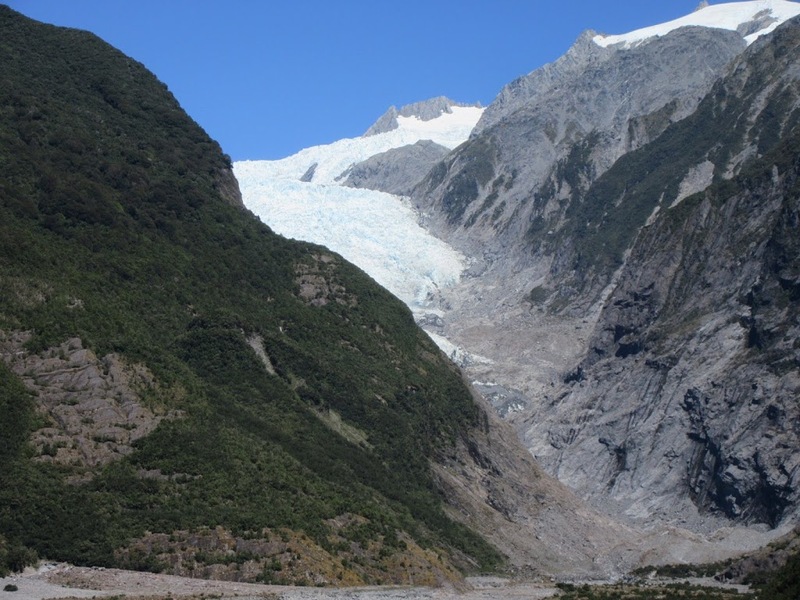 Seriously, New Zealand continued to give, give, give. You name it, they’ve got it. Lakes, mountains, hot geysers, frozen glaciers, waterfalls, dry river beds, white water rapids and plunging canyons; gorges forged in the ice age, river valleys created by retreating floods, volcanic deposits, avalanches, and sheep. There’s lots of sheep. We were on a hectic schedule. No lazy lie-ins for us. There was a whole country out there to see and thanks to our wonderful tour guide Laurel, a walking-talking New Zealand encyclopaedia, we learned all about Maori folklore alongside a catalogue of NZ’s more recent history. 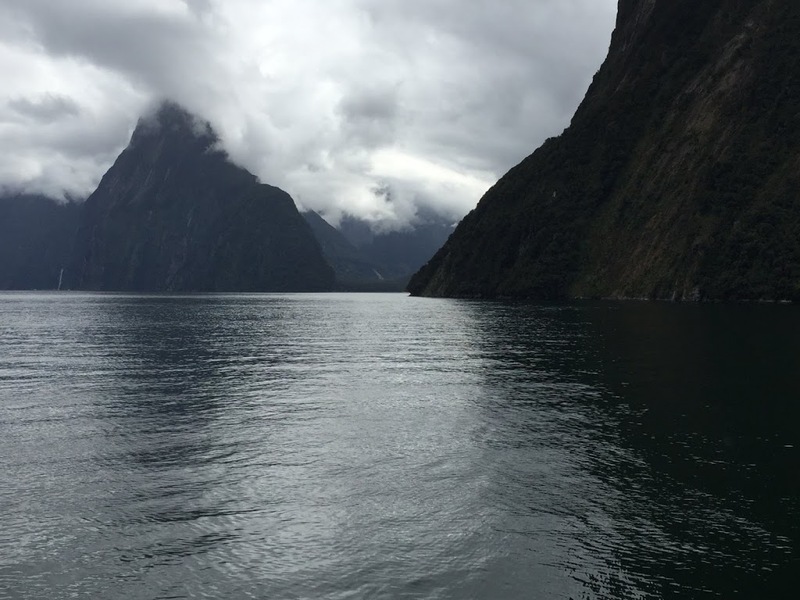 The Maoris have an explanation for every feature on the landscape, every lake, every mountain is a legend embedded into their history. We learned too about the early European settlers, the farmers who were promised pasture but discovered a land covered in forests of deep bush, and the pioneers, determined to conquered unchartered territory and carve their way through rugged mountain passes from coast to coast. 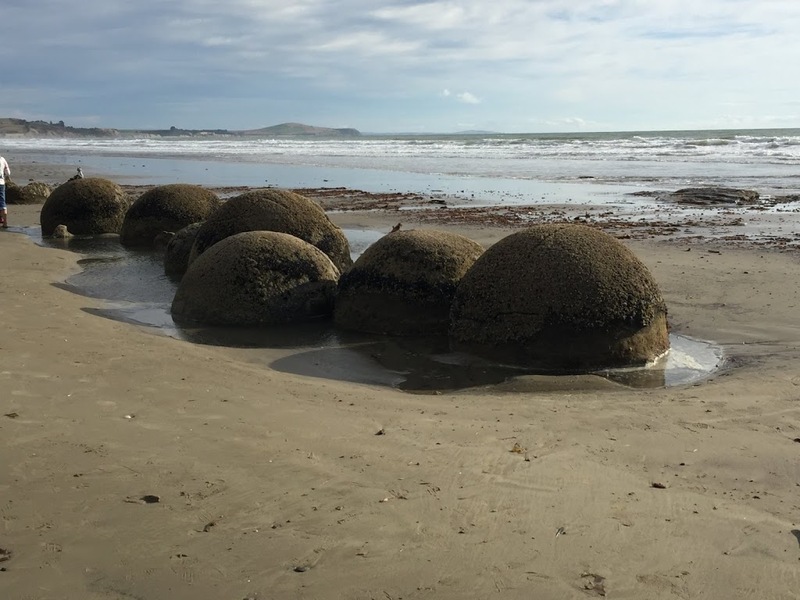 New Zealand is a fascinating country. It not only looks beautiful but its people are welcoming and share a stoic sense of resilience and a great sense of humour. In our second week we travelled from Wellington on North Island to Christchurch in the south before heading inland and across The Southern Alps. We spent a couple of days in the adrenalin hotspot of Queenstown. Youngsters from all around the world congregate here to ski and snowboard in the winter and bungy Jump and white water raft in the summer. We took a jet boat ride on the Shotover river which seemed pretty adventurous for us but probably quite tame by Queenstown standards. We travelled across vast plains and through mountain passes to the eerie wilderness of Milford Sound, we headed further south still to Dunedin before heading north again to spend our last night overlooking the majestic shores of Lake Takepo before moving back to Christchurch, which six years on is still reeling from the devastating earthquake of 2011. We saw the weird and the wonderful – from the natural landscape of the Moeraki boulders to the Victorian melodrama of Oamorua, now a mecca fot steampunk fans everywhere and where incidentally our bus broke down…. As for the weather well Four Seasons in One Day is an understatement, jackets were on, then off; raincoats are a must but then so are sunglasses. NZ really is all its cracked up to be, and as for that bus, and those forty people well I admit we did start off in great trepidation but having covered 1800 miles in two weeks we bonded! 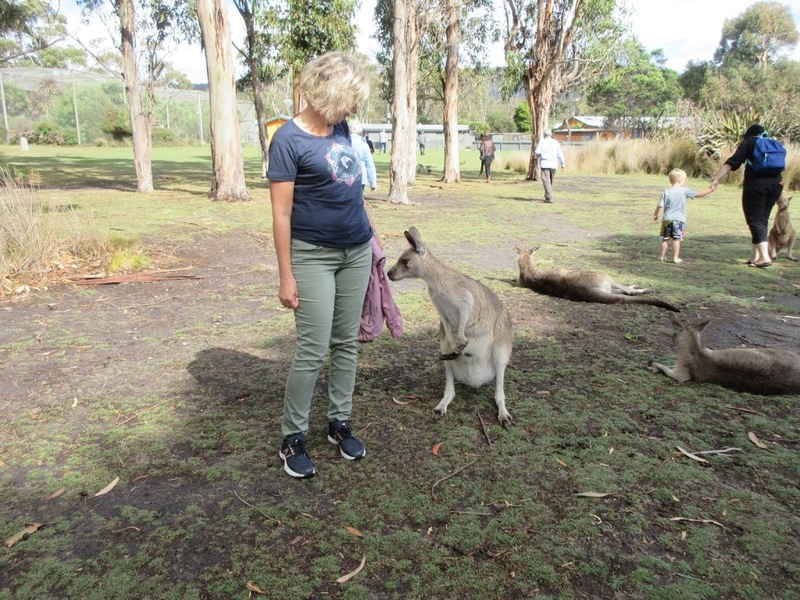 We made new friends and had great fun, and it now seems quite daunting to be setting off to Australia on our own…. We are now well into our tour of New Zealand, and sorry Sydney, but you have a rival for my affections. Mr T and I have never done a coach tour before, mainly because (a) we’ve never felt old enough and (b) we are usually very happy to potter about under our own steam. However, as we are doing our own thing for 4 weeks in Australia, when it came to planning what to see and what to miss in New Zealand – with tropical rain forests in the north, and fjords and glaciers in the south – we decided to let somebody else take the strain of choosing our route. 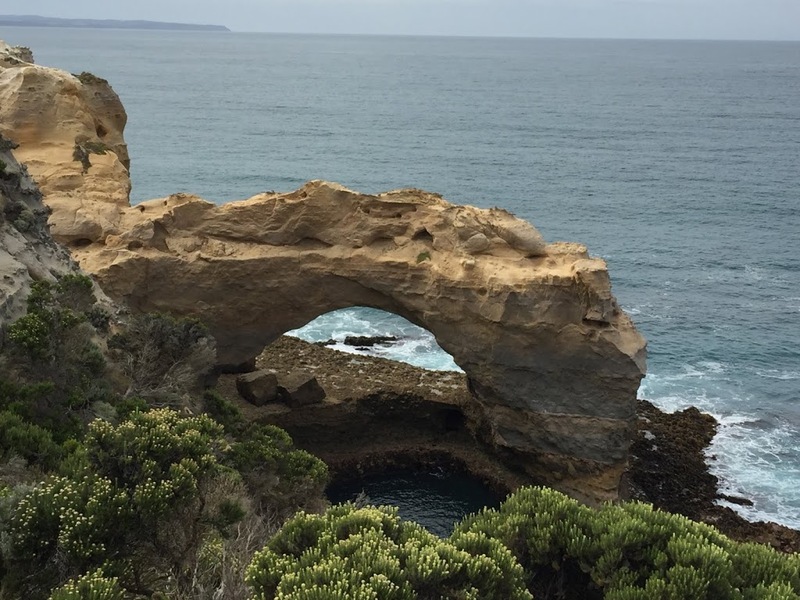 I have to admit we may well be youngest in our tour group, but it’s not many a non-retiree who can afford to take the time off work and a trip to the Antipodes needs time, as we are rapidly finding out! So, who has stolen my heart? 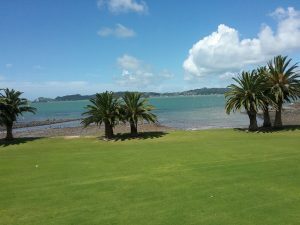 The Bay of Islands and in particular the small town of Paihia, approximately 300 km north of Auckland. I dont need cities with glistening white skyscraper skylines, I’m a country girl at heart. Give me green spaces (and NZ has an awful lot of them) a sweeping coastline, and I’m happy. Add in dozens of islands dotted across the bay, palm trees, sand, dolphins, and I’m in heaven. We had a room with a view, and what a stunning view it was. We had apparently been bumped up from the usual ‘garden rooms’ at our hotel by the prime minister’s entourage. Thirty-seven year old Jacinda Adhearn (take note UK – young, woman, prime minister) was in Paihia along with several hundred Māori for the Waitaingi Day celebrations – the annual commemoration of the signing of the original treaty between the Maori population and the British and a national holiday in New Zealand. Pahia is a beautiful place, with an old fashioned ‘au naturale’ unpretentious, charm. 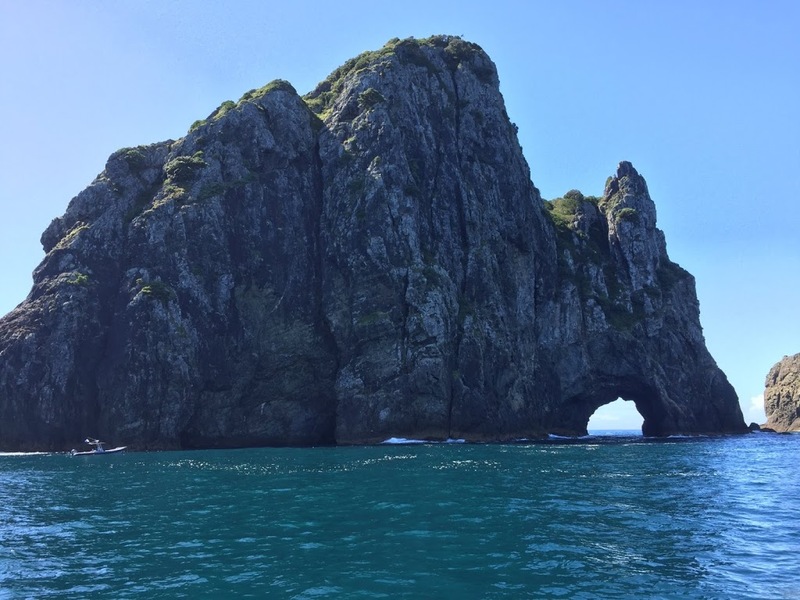 Our view and the hole in the rock – just one of many islands in the bay! It was almost sad to leave, but leave we had to, because we had a lot of kilometres to cover and a lot more sightseeing to fit in. 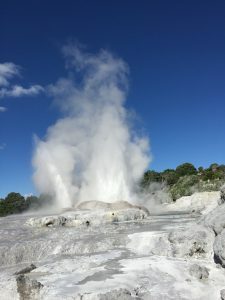 After another brief pit-stop in Auckland, the City of Sails and home to almost a quarter of New Zealand’s total population, we headed for Rotorua. Rotorua is famous for its geo-thermal hot springs. When you are travelling with limited resources sometimes you have to improvise; in Paihia hairspray had been used to stupify a couple of rogue mosquitoes into a firm hold; in Rotorua, body spray doubled up as air freshener in an attempt to disguise the pungent aroma of sulphur that permeates the town and infiltrated our hotel room. At the thermal village of Te Puia, Rotorua’s largest geyser Pohutu performed right on cue, sending up a steamy spout 30 m into the air. Sadly, the reserve’s population of endangered kiwis were not quite so forthcoming. Kiwis are nocturnal, and also very shy. We had to make do with a stuffed model during a talk by a kiwi conservation expert. We couldn’t leave Rotorua without testing the medicinal properties of its thermal spa waters for ourselves. They always say good things come to those who wait and we have waited a long time to make this trip. We arrived at the Polynesian Spa (one of the top ten spas in the world according to Conde Nest) to be told by the receptionist that a two people who had been unable to take up their pre-booked session had donated their ticket to the next ‘suitable’ couple. I’d never felt more suitable in my life! There were five pools available to us in our much appreciated complimentary deluxe spa package, all overlooking the calcified and somewhat eerie banks of Lake Rorotua. We hopped from the anti-aging properties of Rachel’s Spring water to the anti-rheumatic delights of the Priest’s Pool. I suppose only time will tell whether the magic of the natural springs will work! The downside of an organised tour is of course sometimes you are organised into doing things you wouldn’t always choose to do. I could have lived without the sheep shearing show, fun though it was, but on the whole, so far things are turning out well. 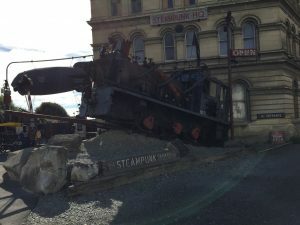 And as for Rorotua, it might well be something of a tourist trap but there’s plenty to see and do. It’s just a question of getting used to that smell. Our ‘grand tour’ has been many months in the planning. 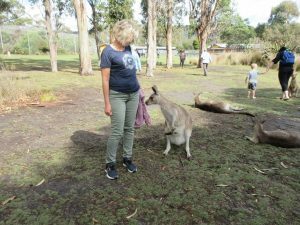 A six week sabbatical exploring Australia and New Zealand, our very own journey of dreams. 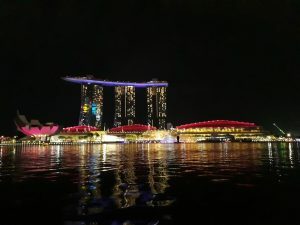 First stop, Singapore; our chance to acclimate and recuperate. Jet lag is a horrible thing, always worse, west to east. A Singapore Sling seemed the perfect tonic, but the old Colonial institution of Raffles was closed for reburbishment, so instead we found Happy Hour on vibrant Clarks Quay, where we learned about the city’s history as an important colonial trading place, and marvelled at the light show at Marina Bay on a night boat trip. Singapore is a real mix of east meets west, great if you love shopping with a myriad of waterproof, air-conditioned malls, but I’m not a shopper. 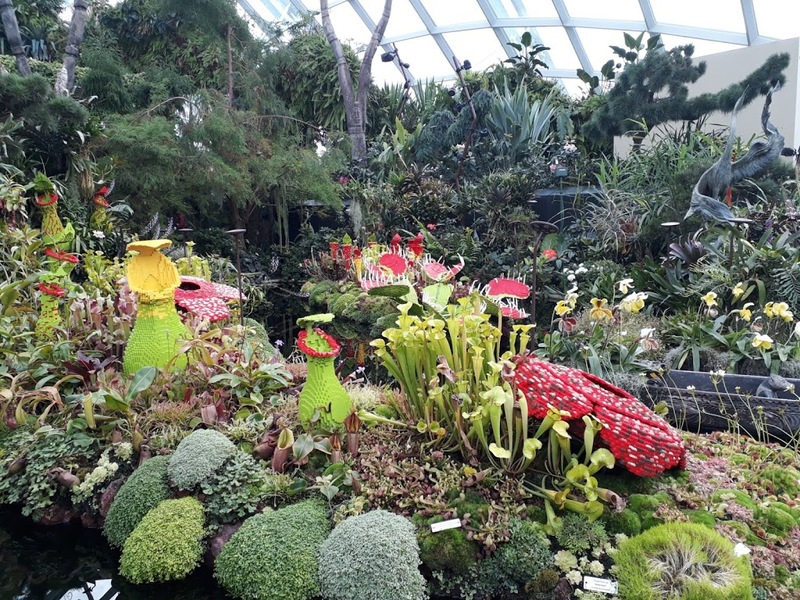 Instead Mr T and I took ourselves off on a clinically clean metro to the Gardens of the Bay, an impressive but Disneyesque ornamental display of horticulture, including giant fake trees and waterfalls, all growing in a totally unnatural and alien environment. The next day we headed for the real botanic gardens, a UNESCO world heritage site, and a genuine oasis in the midst of a modern high rise city. I liked Singapore, but its hot and humid atmosphere left me feeling like a damp rag. No point unpacking the hair straighteners here, but an umbrella is essential. Sydney, on the other hand was a completely different kettle of fish. We arrived early in the morning following an overnight flight with the added benefit of an unexpected upgrade. 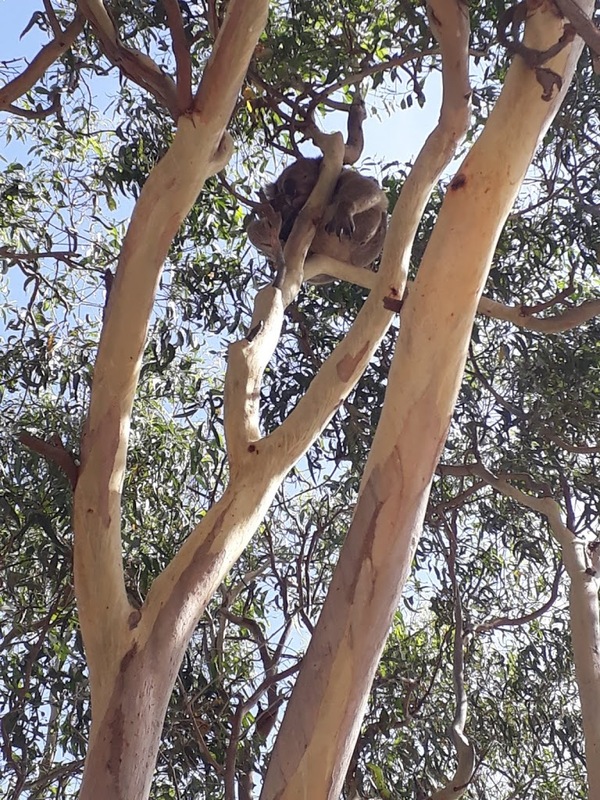 We dumped our bags at our hotel then headed straight for the harbour front and joined a tour of the Opera House, spotting cockatoos, ibises, and even a pair of kookaburras in the gardens en route. Recently Sydney has experienced record breaking temperatures but we soon stopped all that. On our second day we met up with old friends who emigrated 20 years ago. 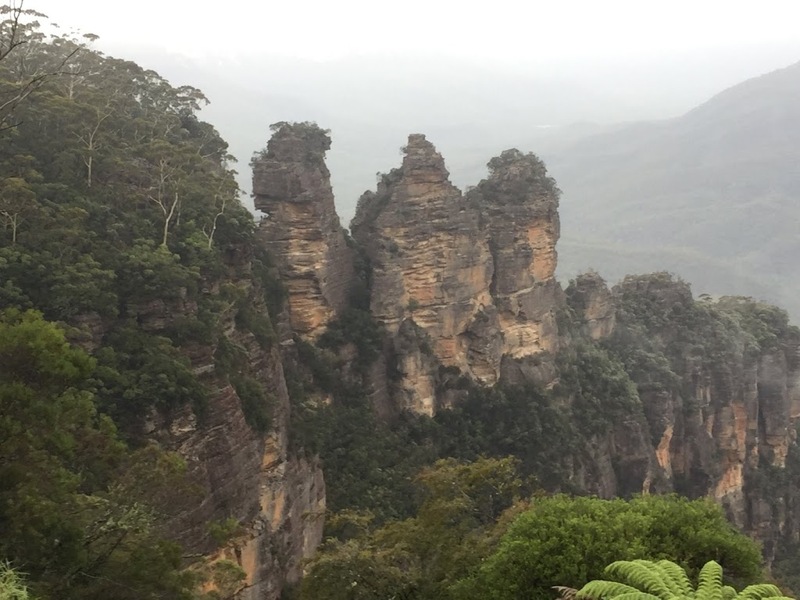 Tbey suggested a trip out to the Blue Mountains and the clouds came down and temperatures plummeted. The thing about the Blue Mountains is the views – but there were no views, only a thick layer of white mist that increased the higher we ascended. We could hear the cascading waterfalls, but we couldn’t see them. 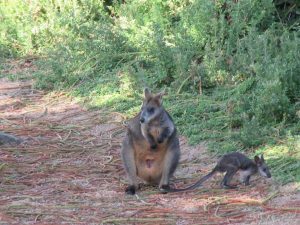 If I’d paid my 140 aussie dollars for an organised tour I might have felt pretty miffed, but fortunately I hadn’t. 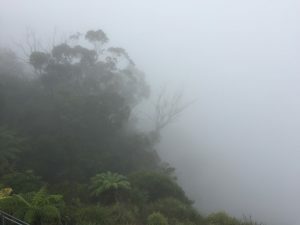 We had years of catching up to do as we dangled over the shrouded rain forest of the Jamieson Valley in a cable car and took a couple of rides on the world’s steepest railway – an earlier foreruuner of a theme park roller coaster but in fact an old mining track – at Katoomba Scenic World. Incidentally Katoomba Scenic World is also the proud user of environmentally friendly ‘who gives a crap’ toilet rolls according to signs in all the loos. Australia is not a place for the faint hearted. We ended our mini-break in Sydney as we began – back at the Opera House for dinner. In between we took a boat across the harbour to the surfer’s paradise of Manly Beach and we walked across the bridge – you can climb it for about 300 dollars but you can walk over it with the same views for free. Plus I’d already faced my fear of heights in the cable car. I didn’t feel the need to do it twice. Our grand tour has been planned with meticulous precision, and although six weeks might seem like a long time, there’s a lot to fit in. It’s speed dating tourism – flirting with several cities in a very short space of time. 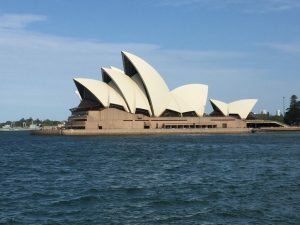 Singapore might be fun for a bit of a fling, but Sydney is the one I want to see for a second date. 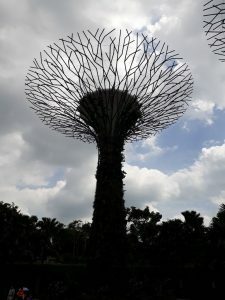 A fake tree in Singapore or the Blue Mountains National Park – complete with its magical mist – you choose!